I try to give what I’m going to sew next a lot of thought. When we got home after our travels in September, I realised that I didn’t need about half of my wardrobe. I donated all of my old clothes and shoes but I think some more pruning is still in order. With this in my mind, outside of two sweaters and a packet of tights, I have bought no other clothes since then. Instead, I have thought really hard about what I like to wear and how I want to portray myself. I have started using Pinterest to collect details that I like. I like to survey what I’ve collected and pinpoint exactly what aspects appeal to me, why and how I think I could wear it regularly. For example, without realising it, I have been collecting a lot of inspiration with pintucks, chiffon fabrics and pleats. So, from the point of view of adding to my wardrobe for spring, I think a chiffon blouse with pintucks would be most useful, as would a floaty pleated skirt. This way, I get the satisfaction of putting my time into sewing clothes that I really really want. I know from knitting that it’s easy to get sucked into the next popular thing, but making clothes takes time and effort and money, so I try to give it consideration. Do you plan like that too? Am I sucking all spontaneity out of sewing?! Anyway, this little top has a little story. 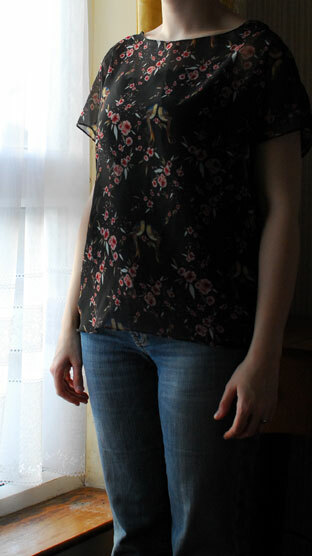 Pattern: Another Kimono top from Salme patterns (downloadable). I enjoyed making the first one so much – mostly because it was so quick – that I wanted to make another. Fabric: 1m of 150cm wide Liberty print (I think) chiffon. I paid €10 but it was supposed to be €17. The fabric called out to me. It was expensive but I thought, heck, just one metre, it’ll make a beautiful top that I can wear out or for playing. The lady cut it but one side ended up about 80cm and the other over 100cm. So she cut it again. This time it ended up even worse. I think the diagonal print pulled it strangely. Third time, she got someone else to do it. I stood there and watched her cut the straightest line since rulers were invented – and still it wasn’t right. I ended up with a sort of trapeze but at least the shorter end was a metre. They charged me a tenner and put the bolt downstairs for further inspection. It was a bargain but like many bargains, it had its price. I was extremely careful cutting it out. I even drew around my pattern pieces so I could be sure it was straight. I thought it was ok until I sewed the front and back together. Thankfully the arm and neckholes matched up but the front side seams were quite a different shape to the back side seams! I had to fudge it a little but it turned out ok. 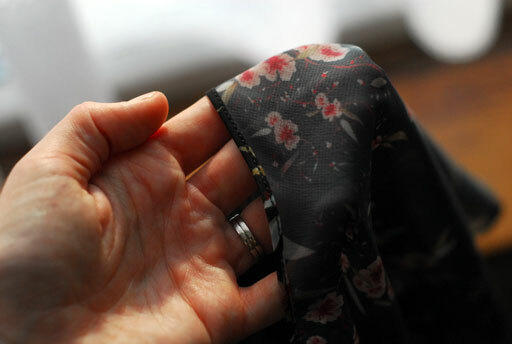 I learned on my last kimono blouse that my narrow hem foot doesn’t really do sewing in the round very well, it doesn’t know what to do when it comes to joining up at the end of the round. 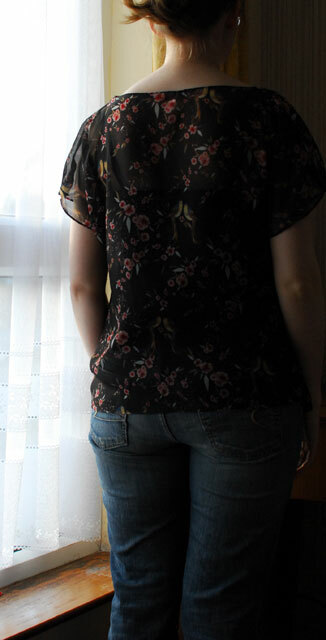 So for this blouse, I hemmed my pieces separately before sewing them together. This included the neckline and armholes. I actually don’t know what I would have done without the foot; I probably would have had to do it by hand. I also used my ‘overlocking’ foot. It doesn’t cut, but it provides a really nice guide for the zigzag. This was a really simple top to practice such finishing techniques and I think it turned out really nicely, all strange fabric pulling aside. I have subsequently bought some plain ivory chiffon for aforementioned pintuck blouse (at a much more reasonable €4.50/m) and it just behaves like any other fabric, so I hope it was just an anomaly. 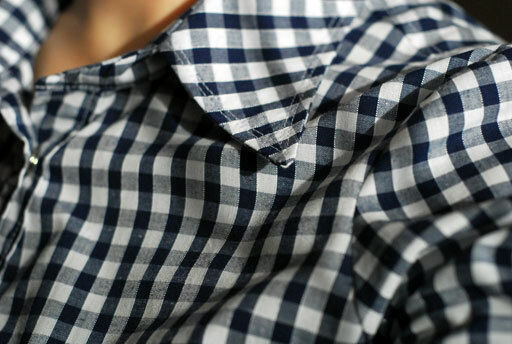 For many months, I have longed for a check blouse. Pattern: Liverpool (again), by Amy Butler. 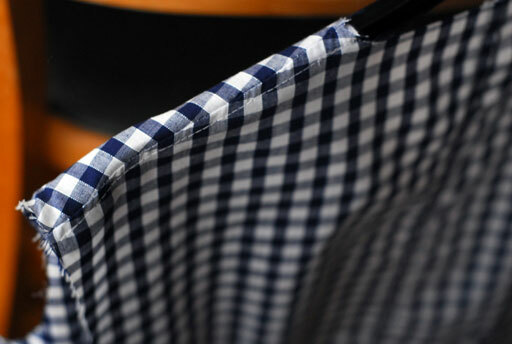 Fabric: About 1.5m of 150cm wide gingham check from Murphy Sheehy’s. I can’t remember exactly but I think I paid about €12-13 for it. 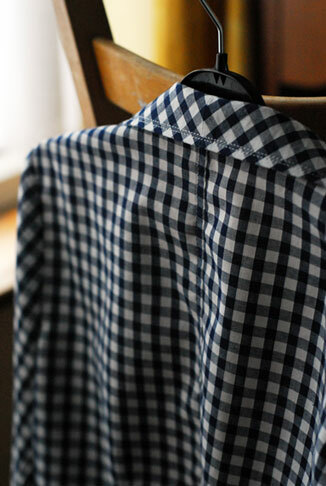 It’s a nice quality gingham, substantial enough to be warm but not heavy. So I made a few modifications to the pattern. Some were the same as the last one – I shortened it a lot and added an extra 1.5″ to the front. 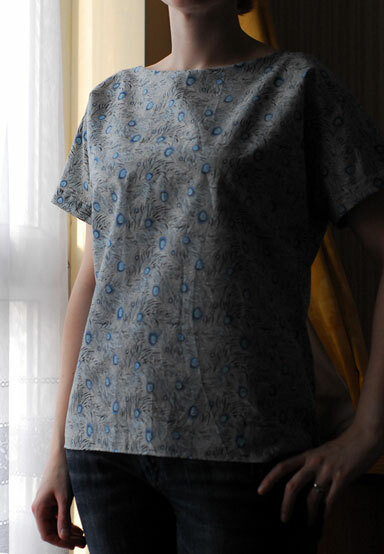 This time, I also cut the collar and cuffs on the bias. 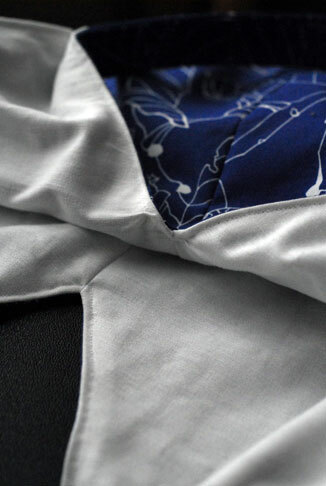 I really wanted to do the placket as well but I didn’t have enough fabric. In fact, I barely had enough for the collar. I had to cut it in halves and sew them together. Needless to say, matching all those lines, whether biased or not, was time consuming. I branched out a little and used snap closures because I thought it suited the style better. I’d never used these before but it was really easy. This is a closure I will definitely use again. This was definitely easier the second time round and I love having the variety of a comfortable check blouse in my wardrobe. About two weeks ago, when Alb was away for work, I took a trip to Ikea. For me to do so is easy as my local bus goes right there. To go by myself, have a browse then some tea and cake before coming home is a pleasant distraction that I save for occasions such as when Alb is away. My main reason for going was to get some more of their ‘Bomull’, a cheap cotton (€2 a metre) that I use for trying out a pattern before I sew it up properly. I saw some of this heavy-weight cotton and thought immediately of this pattern. 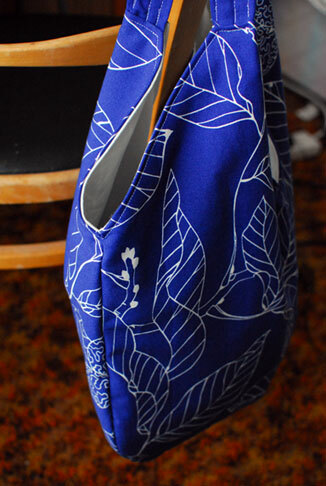 Pattern: Practical Bag, by Tanya Whelan. Fabric: The pattern calls for a yard but I eked this out from just 50cm of 150cm wide home dec cotton. I used the same amount of scrap home dec weight cream cotton (also Ikea) to line it. It was about €5, not counting the cost of the lining. It is really hard to take photos of a flat, wide bag like this! I hope they somewhat convey how spacious yet compact the bag actually is. It’s a spur of the moment, going to the beach today, kind of bag. Or, in reality-land, where I’m from, it’s have to bring all this music along with my organ shoes, water, lunch and knitting, cheerful way to lug it all around, kind of bag. I think the straps are what wins out in this pattern. Wobbly topstitching aside, these guys are four layers heavily stitched into the bag. The ‘V’ shape in the centre means the straps aren’t an annoying length but you can still wear it comfortably over your shoulder or arm. There are pleats in the base. Here’s the lining. 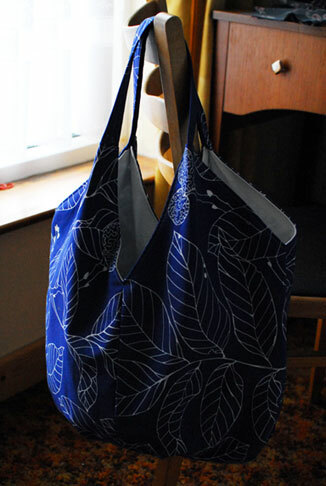 Overall, it was a quick and easy project – much easier than the last bag I made. The cotton was pretty heavy to sew so I used a denim needle. It made a massive difference; sewing through all those layers, especially for the handles, was really no big deal. I think the bag would probably benefit from an internal pocket – something like a zippered patch pocket – and a magnetic closure. I also think that it would be more practical sewn in a hardier fabric, such as faux leather or oilcloth. I have a few other things to show soon too. 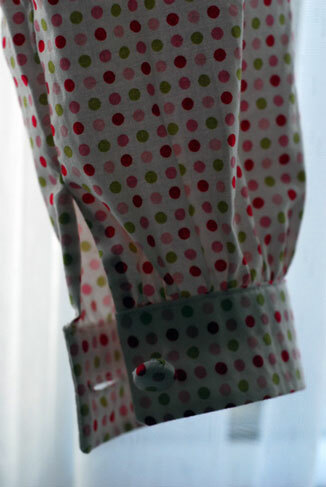 I am only buttons away from finishing my check blouse. So, a little recap. The pattern is from ‘ErikawithaK‘ on Etsy (great service, she posted it right away and it came all sealed in a little plastic slip so it was protected). I was just browsing and stumbled upon it. The fact that it was exactly in my size and had four different options (long sleeves, short sleeves, with or without pintucks) sealed the deal. It’s a little boxy, which was the style then, but I quite like it and it sits very well under knitted garments. 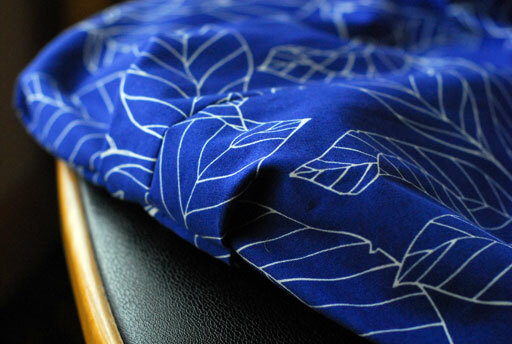 The fabric was 1.25m of Tilda stretch cotton, 150cm wide, from Rubanesque, for about €25. 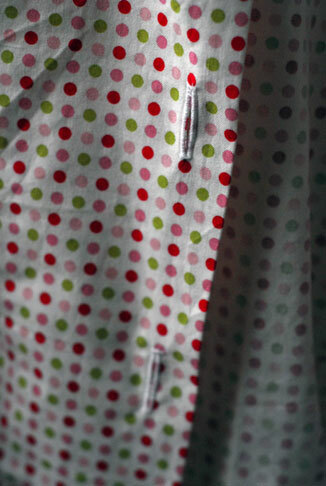 Definitely not cheap but as I found with my other Tilda fabric top, it is actually worth paying for. I washed it because the tag said it had a little shrinkage but it ironed out beautifully. It was lovely to work with and I expect this is a blouse I will reach for for a long time. I mentioned in my last post that I got some new feet for my machine. 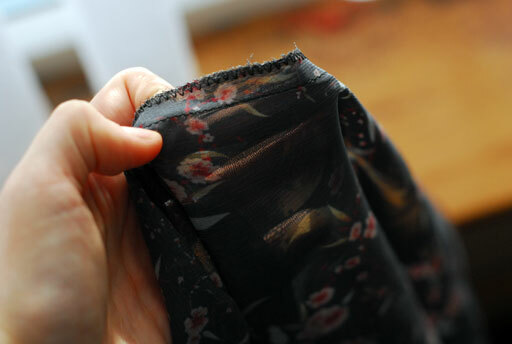 Amongst them was a buttonhole foot so, after a little practice, I let it loose on my blouse. Never looking back. Just sayin’. The cuffs were something new and a little challenging for me. I think the fine finishing on them could have been a little better but they both look the same and they fit very well. What helped my sanity on this project was not bothering to match the dots. 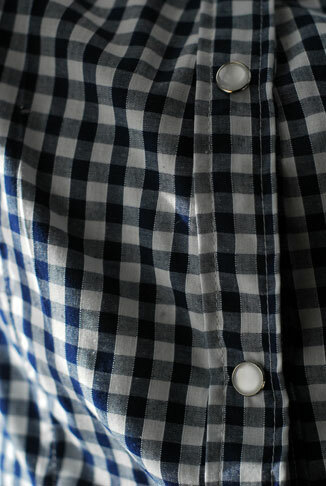 I have since moved on to a gingham blouse. Oh. My. God. Today was the first time in days we had proper daylight so I grabbed my opportunity. I was hoping to show this and my other blouse at the weekend but it was too dark to take photos. 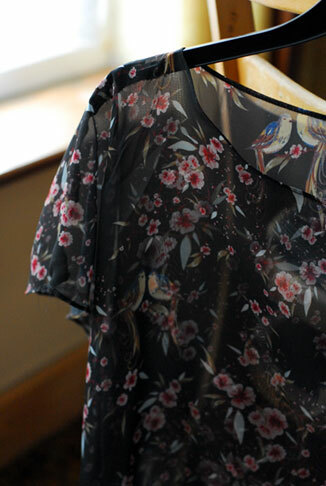 Pattern: Kimono Top by Salme. Fabric: Barely 1m of Liberty lawn, €15 from Murphy Sheehy’s. I got the very last metre of this stuff so I got a wee reduction. Beautiful stuff to work with. The pattern was extremely easy. A few things, though: the pattern is pretty voluminous. I measured the pieces and went for the smallest size. Seam allowances aren’t included in the pattern so I cut two sizes bigger and used the difference as my allowance (1/2″). 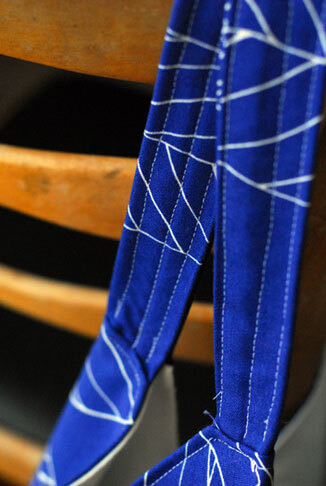 Making the cuffs was completely pointless – though it would look nice with a contrast colour if I were to make it again. It took me about 3 hours total to make, including printing out the pattern. It probably would take even less if I used a bias binding on the neckline instead of the facings. 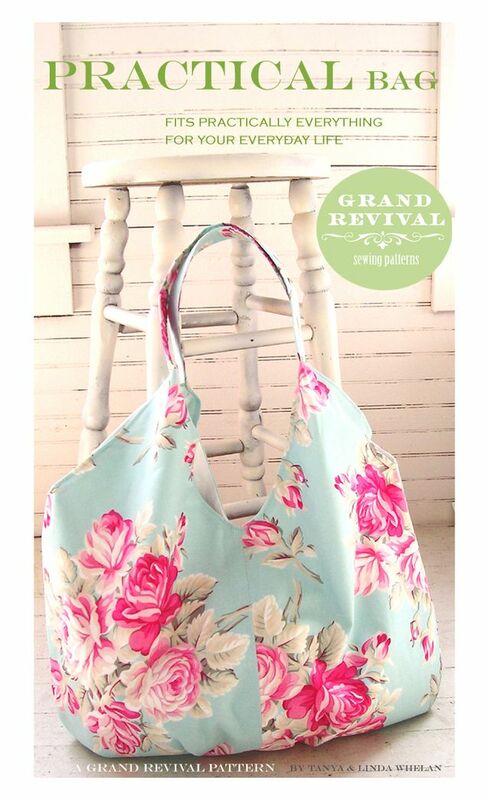 This pattern is definitely joining the quick-sewing-fix group! I think I’d like to make another and perhaps also lengthen it into a dress. This was the first project I used two new attachments for my machine on. The first was an ‘overlocking’ foot, which doesn’t technically overlock, but provides a guide so as to give a lovely finish to a zigzagged edge. Just what I needed. The other was a narrow hem foot. This mimics the rolled hem hand finish and is lovely on light fabrics like this one. I am amazed at the difference such a simple attachment could make; I’ll definitely be using both again.